James 315, also known as the Saviour of Highsec, has today announced he has become the CEO of CCP by popular vote. The owner of minerbumping.com was able to exploit a loophole in Icelandic law to vote on behalf of employees at CCP, in a similar way to how he was voted Saviour of Highsec. The move has drawn a mixed response from Eve players and CCP employees. CCP Hellmar, the former leader of CCP, has said that although he is now unemployed, he acknowledges that the move will be good for Eve in the long run. Not everyone has taken the news so well though. We asked an enemy of the New Order for his views on the subject. He simply said "f*** f*** f*** f*** f*** f*** f*** f***". James's New Order and many residents of Lowsec, Nullsec, and W-space are delighted at the change of leadership. It seems likely that Eve's development will now be based on James's CSM 8 Agenda. James stated that ever since he pulled out of the CSM 8 race he has been working on a way to influence the development of Eve. The development came when an angry miner who James had bumped tracked him down in real life and threw a book containing Icelandic Corporate law material. He discovered he could displace Hilmar Veigar as CEO by achieving the votes of 80% of the staff. This represented a dilemma, until he remembered he could vote on behalf of the staff, as he was voted to be Saviour of Highsec by the miners themselves. Some of the changes the Saviour wishes to make include the immediate shutdown of Dust 514, with all isk seized from Dust characters and transferred to Eve characters with active subscriptions. Dust is expected to go offline permanently during a regular downtime tomorrow. It shall also be posthumously renamed Dust 315 in honour of the new leader. Other non-Eve changes include the abolishment of World of Darkness and giving a 95% paycut to the employee who proposed it. He has also announced a new expansion, named "The Era of 315". It's unknown exactly what this expansion will contain, save that it will likely involve the near destruction of Highsec. Among the most popular changes among supporters is the new 'sec tax'. This means characters with a positive security status will now suffer a tax that is proportionate to their sec level. A character with +0.1 status will receive a tax of 10%, and a character of +5 status will find they are levied 500% of all their incomes. This money will be redistributed to those with negative security statuses, ensuring that this new policy will keep the economy balanced. Asteroid belts will now also deal environmental damage of 10,000 omni per minute in Highsec, scaling down to 10 thermal damage per hour in -1 security Nullsec. The change is expected to drive up the number of residents of Lowsec and Nullsec, as well as the price of low end minerals. This policy has been perhaps the most heavily criticised change, with riverini of Eve News 24 blaming The Mittani for this feature. He said "This is clear evidence that The Mittani is corrupting the game. 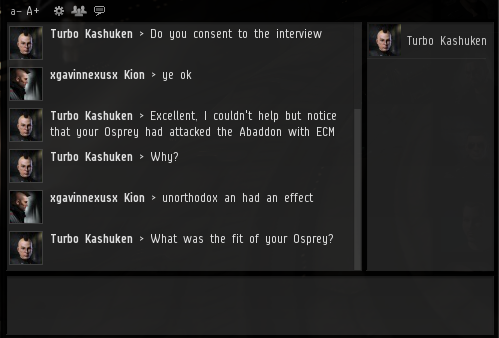 He has clearly stockpiled minerals for years in preparation of the event, and now Goonswarm will be able to completely take over nullsec with their supply of minerals. James 315 is literally Mittani." James shrugged off this criticism, and posted a picture of himself laughing at their anger. When several carebears told him to kill himself, he uploaded another picture of him drinking a lake through a straw, with a caption saying 'Your tears, they are delicious.' Hundreds of NPC alts have taken to the forums to complain about their new leader. 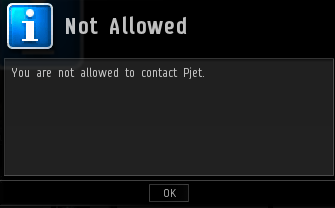 The newly knighted CCP James 315 has taken a back seat in the four hundred page long argument between his supporters and his opponents, though he has already wielded the ban hammer against his foes. Among the most popular comments was "x accounts unsubbed", however CCP employees have commented that subscription numbers have actually risen. In other areas of the forums, James has posted ideas containing thoughts such as ships randomly exploding in Highsec. Since many carebears don't know Features & Ideas Discussion exists, it seems that James will take the overwhelming support of his followers as a clear sign it should be implemented. These are truly exciting times for Eve Online, James has promised to completely revolutionise the game. It remains to be seen whether the new expansion will be received extremely well by the community, or only very well. Band of Brothers. Pandemic Legion. Brave Newbies Inc. All three of these entities have been regarded as the premier PVPers in Eve at some point during the game's extensive history. However, we've been contacted by a disgruntled BNI member who has revealed that despite what the battle reports and propaganda show, BNI are actually ineffectual at fighting other players. The inside source claimed that although Brave Newbies and their alliance Brave Collective have an Eve-wide reputation for their skills at PVP, they actually rely on numbers to lose battles. 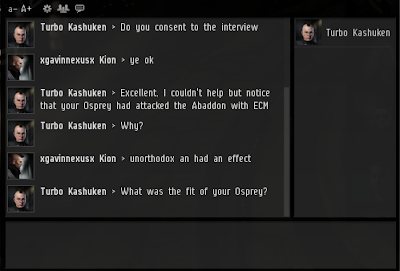 He went on to say that "BNI relies on bravery and carelessness to win fights, they're nowhere near the best small gang PVP organisation in Eve. I don't even know why people think they are." He then went onto link a website called 'evekill', which apparently showed BNI had a poor combat record. However this link appeared to be counterfeit due to this very fact. When I put this evidence to a member of TEST, they seemed to be quite overwhelmed by the theory. "Anyone who reads Reddit will be able to tell that BNI are the meanest PVP machines out there. Everyday they post a video or report of a battle where they slaughtered their enemies. The very thought of even seeing a member of BNI scares me, which is why I stay twenty jumps away from Rahadalon." This anonymous TEST member isn't alone in his fear, Brave Newbies are even more respected than Band of Brothers were in their days, and for good reason. For example they managed to completely slaughter hundreds of Firetails that were on Mangala Solaris's Ganked roam. A traumatised survivor of that fight told me "I ain't playing no Eve [sic] with those people around me! They're too good to be allowed in MY game". At this stage of the investigation it looked like the spy's information was completely false. I tried to get some information from BNI members but they all rejected my convos like mysterious shadows. Since I don't have a 1000:1 kill:loss ratio, I would have no hope of getting into BNI on my own. Therefore the only evidence I could get to support the whistleblower's theory was his link to this 'evekill'. According to their illegitimate looking killboard, the Brave Collective had five times as many losses as kills. Then he sent me an excel spreadsheet (that came attached with information for his Highsec gas planet PI) which apparently 'showed the data in graphical format'. Whether this man is to be believed or not remains to be seen. His 'killboard' holds little weight against the Reddit promoted legends surrounding the murky routines of BNI. Rumour has it this spy has biomassed both his spy character and the unrelated main of the spy, saying that he didn't want to be subject to years of misery by the veterans. In Eve there exists a PVE activity known as 'incursioning'. Though whether they should exist or not is a hotly debated topic, what's certain is that for the first recorded time, a group of incursion runners have managed to kill a Battleship. I asked the owner of the battleship to give us the story of what happened. From the start, abalys was at a major disadvantage. When he saw the flock of +5 sec ships coming towards him, he burst into laughter, which incapacitated him for well over a minute. Having remounted his chair, he noticed that they had actually reduced his shield by 7%. He realised the situation was serious. He wasn't dealing with the average pubbie here; these were among the most elite carebears to be found. Just as he was about to cycle his guns, he noticed one of the Ospreys was applying ECM to him! To an experienced PVP like abalys, the very notion of ECM on an unbonused ship is ludicrous. It was clear that the carebears didn't want that tank anyway. Abalys wasted no time in telling his friends how stupid these band of carebears were, dismissed the threat and went to make a cup of tea. He wanted to know how much longer it would take for him to die, so he started up Excel. His spreadsheet told him he had about an hour to live, so he took his dog for a walk. Thirty minutes after the fight had started, he returned to his keyboard. His armour was now at 50%. 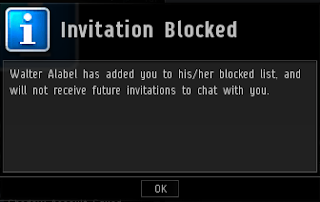 Abalys is a sporting player, not a PVP tryhard. He graciously let the carebears get this close to killing him to get their spirits up and encourage them to come again. Just as he locked the ECM Osprey up, he disconnected. Then his computer exploded. The battle was over, abalys had no hope of logging in for the 30 minutes it would take the carebears to finish him. He sat on his bed and contemplated his life in Eve. I convoed the pilot of the ECM Osprey and congratulated him on his victory. Then I asked him about the unusual modules that had showed up on the killmail. Unfortunately, xgavinnexusx Kion then withdrew his kind decision to let me interview him. All parties involved on the kill were unavailable for comment. CVA's leader Equinox Daedalus announced today that jumping into wormholes has been banned due to the discovery they are sentient creatures. The announcement claimed that the breakthrough had been achieved by months of research from members of CVA and the NRDS Coalition, and that everyone who helped on the project is to be commended. He also stated that anyone found to be breaching the ban would be liable to harsh punishment on behalf of the wormhole that the pilot had offended. The justification for this was that the wormhole feels 'pain' every time a ship jumps through it. The amount of pain it feels is determined by the size and mass of the ship passing through it. I spoke to the lead 'researcher' behind this development, Steve Darwin: "We've discovered that a wormhole's life cycle is literally a life cycle. A wormhole is conceived roughly four hours before it appears as a signature. Then it begins its predetermined life cycle, depending on what species of wormhole it is. When its life cycle runs its course, the wormhole will die of old age shortly afterwards. However a wormhole may commit suicide if it is placed under extreme agony by multiple ships passing through it; if too many heavy ships pass through the hole, the wormhole will lose the will to live and abort itself." Although some people may suggest a more logical explanation for a wormholes collapse, CVA's thinking is certainly new. They have also announced a 'holy war in the name of the Empire' against the chain collapsers that live in wormholes. They say that it is cruelty on an unmatched scale. Unfortunately since they cannot enter wormholes now, they will have to wage this war on the forums and other forms of media. This has received mixed reactions from members of the ProviBlock. Some of them have heralded this as being a new age in human-wormhole relations. One member, who wished to remain anonymous, claimed that the wormholes deserved to 'die in agony' because they lead to the mysterious and dangerous wormhole space. Some non-Providence residents have taken this opportunity to jeer at them, one AFK cloaker reportedly said "I'M JUMPING THROUGH A WORMHOLE- WHAT U GONNA DO?" in local. CVA responded to the threat by sending a 80 man fleet to destroy the interloper. Unfortunately, the wormhole the AFK cloaker was referring to did not exist, and despite the ~500 scanner probes deployed no wormhole was found. As many Highsec dwellers don't know, the CFC has been relentlessly attacking Fountain for several weeks. To a confused noob on Reddit, the war may seem like something that is to do with many bees attacking a water fountain. But that is wrong. Although many people believe that the CFC has been attacking Fountain to get R64s, they've actually done it for a completely different reason. They have grown tired of shooting people, and instead have tried to get good fights out of structures. There are several tactical reasons for doing so, all of which carefully deliberated by the CFC's Directorship, also known as The Mittani and the first three of his alts. The CFC does not find engaging with players fun. Instead. they would rather shoot structures and take hundreds of screenshots of Dreads shooting a POS. There are also rumours that some less experienced players in FCON think that some structures will drop 'rare loot' which can be equipped on Titans to stop them from dying. The fact these structures cannot fight back appears to be drawing the remnants of SMA to shoot them, knowing that their enemy has even less power than red crosses. Perhaps this is what The Mittani meant by 'good fights' when they deployed to Delve. The average line member does seem to be enjoying themselves greatly. When asked for comment, one grunt said "It's good to be back shooting things that can't fight back. It's great knowing that the POS can't doomsday you. During Burn Jita, the one thing that held me back was the fear of my Thrasher being hotdropped by a SOLAR titan. But you don't have to worry about that here. It's great having experienced FCs like DBRB watching our back for doomsday POSes." While it appears the CFC's Ministry for Newbro Education has been successful in driving up fleet participation, there are clearly some underlying issues in their knowledge of the game. Fortunately this hasn't stopped the CFC from taking a bite out of Fountain. Part of this bite included o7m8 systems, which was facilitated by Sort Dragon, as he eagerly explains. "Well I'm glad you asked me for an interview, since noone else wanted to interview me. Let me tell you of the time I was leader of a vast empire that stretched from Period Basis to Delve. That doesn't sound very far, it was actually more than that but I can't remember the names of the regions. Can you cut that part out of the quote? Thanks. So anyway, I didn't like how Tests forums were organised and how they hadn't made DurrHurrDurr biomass himself, so I told BoodaBooda to sort that s*** out. Then he got all 'rebel' on me and told me he was leaving the HBC with Raiden. and Tribal Band. It would've been more effective if he said they'd kicked us from the HBC and renamed it 'The Rebels'. Then I used The Mittani's 3rd party service to sell an Avatar, but he scammed me out of the 285bil I paid for it. He said I could have it back if I transferred all o7m8 sov to him, which I did. Then I realised I aborted the four titans under construction! And then he didn't give me back my isk!" We were also able to gain some evidence that The Mittani was trying to talk to N3 leadership. Eventually they got so annoyed with him convo spamming that they entered the war on TEST's side. BoodaBooda is said to be aroused by this move. So, wonder no more what's going on behind the CFC's closed doors, and Sort Dragon's closed bedroom. Thanks to your new reliable news source, you have your answer. If you would like us to find out about any other nullsec affairs, or lowsec affairs, or highsec tears, leave your requests in the comments.